In any business, human relationships play a decisive role in shaping the job prospects of graduates. With alarming rates of unemployment around the world, the role of the manager in increasing the employability of any business’s graduate interns is crucial. 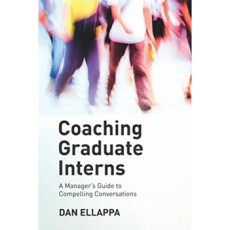 Coaching Graduate Interns will enable you – the manager – to engage with your graduate interns in a life-changing manner. Packed with research-based findings, the book will help you to discern the role that you play in the development of graduate interns. It aims to transform the way you communicate, experience the world and interact with your trainees. Read this if you would like to equip yourself with the skills necessary for unleashing the best in your interns and to learn how to coach them in a way that will kick-start their careers. Dan Ellappa reveals how you can improve your own on-the-job results and quality of life, as well as that of your team, and play a part in improving a global problem. “A ‘must read’ for any manager who wishes to elevate themselves to a higher level of personal and professional growth. In doing so, these managers will make a difference in the lives of the next generation of employees and the world at large.” – Renier Steyn, Professor of Leadership and Organisational Behaviour.